This page lists the collection of BioBricks developed by our team for the project Cellock Holmes - A Case of Identity. This part is an RFC -compatible version of BBa_E0030. The start and stop codons have been removed to make it RFC -compatible and the part is flanked by the RFC  prefix- and suffix-sequences. 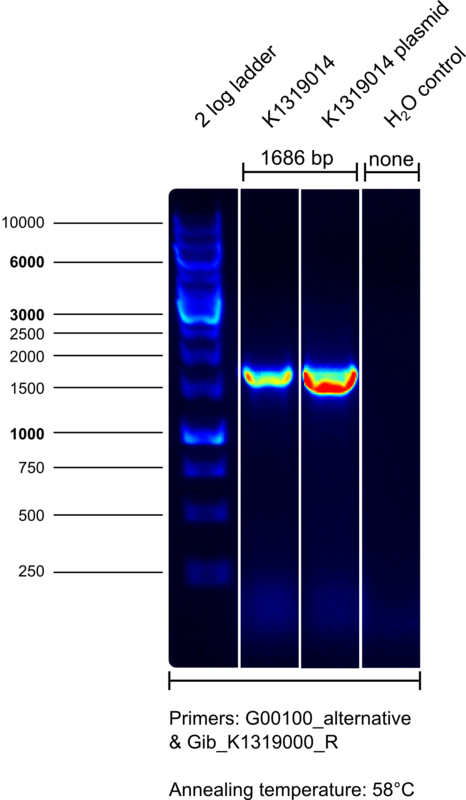 The coding sequence encodes EYFP (enhanced yellow fluorescent protein) which is derived from A. victoria GFP. The excitation is 512 nm and the emission is 534 nm. This part was used to create the parts K1319001 and K1319002. It can also be used in a fusion protein instead of E0030 due to its RFC compability. This part is a RFC dark quencher that is based upon K1319000 (the RFC version of E0030/EYFP) called REACh1. This protein is designed to be a dark quencher for GFP (E0040) in a FRET system. When used in a fusion protein with GFP it reduces the observed fluorescence of GFP drastically. In the biobrick K1319013 this is realized and the proteins are fused together with the linker K1319016 which includes a specific TEV protease (available as K1319004) cleavage site. The fusion of the proteins bring GFP and REACh1 in proximity to each other which allows GFP and REACh1 to act as donors and acceptors in a FRET (Förster Energy Transfer System) system. GFPs emission energy is thereby taken up by REACh1 and released as thermal energy instead of visible light. This eliminates the GFP fluorescence and allows the release of a strong fluorescence signal, if a TEV protease is expressed and the linker is cut. The cutting separates GFP and REACh1 cancelling the FRET interaction and providing a GFP fluorescence response. In order to characterize K1319001 it was expressed as a fusion protein together with GFP to show its quenching ability. This fusion protein, produced by K1319013, was located on the plasmid backbone pSB3K3. To show that the reduced fluorescence was due to the quenching ability of K1319001 and not based on a faulty expression, K1319008 was also introduced into the cells on a pSB1C3 backbone to create a double plasmid system. Both constructs were put into E. coli BL21 (DE3) and compared to I20260 and B0015. B0015 was used as a negative control and I20260 was chosen as a positive control due to the expressed GFP being identical to the GFP being expressed in the fusion protein of K1319013 and having the same promoter, RBS, Terminator and plasmid backbone. The double plasmid system, B0015 and I20260 were measured in biological triplicates and after 2 h one set of triplicates of each of the three systems were induced with 50 µl 100mM IPTG in their 50 ml culture (500 ml shake flasks). Fluorescence measurement was performed with the Synergy Mx from BioTek with an excitation wavelength of 496 ± 9 nm and emission wavelength of 516 ± 9 nm. The following graph shows the resulting fluorescence adjusted for the measured optical density to account for difference in growth of the cultures and to only show the fluorescence per cell. After induction with IPTG after 2 h the double plasmid system produced a fast fluorescence response with an over 9-fold increase compared to the non induced state. I20260 served as positive control and B0015 as negative control. The strong fluorescence response (9-fold increase) after induction with IPTG shows the functionality of GFP inside the fusion protein. After the induction a TEV protease is produced which is specifically cutting the recognition sequence build inside the linker (K1319016) between GFP and K1319001. The cutting results in a separation of GFP and REACh1 collapsing the FRET system between the two. This results in a fluorescence signal of GFP due to the fact that the emission is no longer absorbed by REACh1 and emitted as heat but rather as fluorescence with a wavelength of 511 nm. The very low fluorescence in the non induced double plasmid system of K1319013 and K1319008 shows the functionality of K1319001. 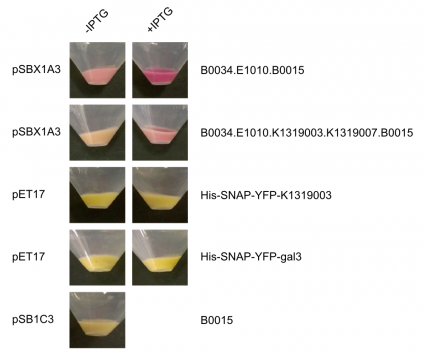 As established before, the GFP is being expressed correctly inside the fusion protein, therefore the reduction in fluorescence in the non induced double plasmid system is a direct result of the quenching ability of K1319001. The quenching, after subtraction of the background fluorescence, reduced the fluorescence of GFP by a factor of 12,5. This also includes the slight leakiness of the TEV protease. To eliminate the effect of the leakiness of the K1319008 construct in determining the quenching ability of K1319001, K1319013 was also compared against I20260 and B0015 on its own under the same condition as above (again in a biological triplicate). The expressed fusion protein K1319013 exhibits a fluorescence more than 30 fold smaller as the positive control of I20260. This experiments shows that the fluorescence of the fusion protein GFP-REACh1 is more than 30-fold lower than normal GFP expression under identical circumstances (same backbone, promoter, RBS, terminator and cultivation circumstances). This demonstrates a quenching percentage of GFP of >96 %! To prove that the measured constructs were the same as assumed the plasmids were tested with specially designed Check PCRs with one primer binding upstream on the plasmid backbone and one primer binding specifically inside the insert. The following results were obtained for K1319013. The length of the PCR product matches the length of the control plasmid. The PCR clearly shows that the used plasmid had the correct insert. After a positive identification of K1319013 the double plasmid system was also checked for the correct TEV protease plasmid K1319008. This PCR also positively identified K1319008. Additionally both parts were sequenced. The sequencing data for K1319008 and K1319013 can be found in the parts registry. The induced double plasmid systems K1319013 + K1319008 and K1319014 + K1319008 exhibit a clear fluorescence response in our sensor cells which in response to induction with 2 µl IPTG. To further characterize the REACh construct, they were introduced into the sensor cells which were then induced with 2 µL IPTG with a concentration of 100 mM. Subsequently, we took fluorescence measurement read-outs (GFP, excitation 496 ± 9 nm, emission 516 ± 9 nm) roughly every 10 min in the plate reader. The results were plotted in the heatmap shown on the left. The heatmap shows an increase of fluorescence from blue (no fluorescence) to red (high fluorescence). It is clearly visible that the induced chips are exhibiting a significantly higher fluorescence than the non-induced chips. This again shows that the constructs work as intended: The TEV protease cuts the linker so that the fusion protein is separated into GFP and a dark quencher, disabling the quenching. GFP has a clear fluorescence emission after the fusion protein has been successfully cut into two pieces by the TEV protease. This part is a RFC dark quencher that is based upon K1319000 (the RFC version of E0030/EYFP) called REACh2. This protein is designed to be a dark quencher for GFP (E0040) in a FRET system. When used in a fusion protein with GFP it reduces the observed fluorescence of GFP drastically. In the biobrick K1319014 this is realized and the proteins are fused with the linker K1319016 which includes a specific TEV protease (available as K1319004) cleavage site. The fusion of the proteins brings GFP and REACh2 in proximity to each other which allows GFP and REACh2 to act as donors and acceptors in a FRET (Förster Energy Transfer System) system. GFPs emission energy is thereby taken up by REACh2 and released as thermal energy instead of visible light. This eliminates the GFP fluorescence and allows a release of a strong fluorescence signal if a TEV protease is expressed and the linker is cut. The cutting separates GFP and REACh2 cancelling the FRET interaction and providing a GFP fluorescence response. In order to characterize K1319002 it was expressed as a fusion protein together with GFP to show its quenching ability. This fusion protein, produced by K1319014, was located on the plasmid backbone pSB3K3. To show that the reduced fluorescence was due to the quenching ability of K1319002 and not based on a faulty expression, K1319008 was also introduced into the cells on a pSB1C3 backbone to allow for a double plasmid system. Both constructs were put into E. coli BL21 (DE3) and compared to I20260 and B0015. B0015 was used as a negative control and I20260 was chosen as a positive control due to the expressed GFP being identical to the GFP being expressed in the fusion protein of K1319014 and having the same promoter, RBS, Terminator and plasmid backbone. After induction with IPTG after 2 h the double plasmid system produced a fast fluorescence response with an over 10-fold increase compared to the non induced state. I20260 served as positive control and B0015 as negative control. The strong fluorescence response (10-fold increase) after induction with IPTG shows the functionality of GFP inside the fusion protein. After the induction a TEV protease is produced which is specifically cutting the recognition sequence build inside the linker (K1319016) between GFP and K1319002. The cutting results in a separation of GFP and REACh2 resulting in a collapse of the FRET system between the two. This results in a fluorescence signal of GFP due to the fact that the emission is no longer absorbed by REACh2 and emitted as heat but rather as fluorescence with a wavelength of 511 nm. The overall fluorescence of the double plasmid system reaches the fluorescence level of the positive control indicating a total clavage of all fusion proteins by the produced TEV protease. The very low fluorescence in the non induced double plasmid system of K1319014 and K1319008 shows the functionality of K1319002. As established before, the GFP is being expressed correctly inside the fusion protein, therefore the reduction in fluorescence in the non induced double plasmid system is a direct result of the quenching ability of K1319002. The quenching, after subtraction of the background fluorescence, reduced the fluorescence of GFP by a factor of 10. This also includes the slight leakiness of the TEV protease. To eliminate the effect of the leakiness of the K1319008 construct in determining the quenching ability of K1319002, K1319014 was also compared against I20260 and B0015 on its own under the same condition as above (again in a biological triplicate). The expressed fusion protein K1319014 exhibits a fluorescence more than nearly 25-fold smaller as the positive control of I20260. This experiments shows that the fluorescence of the fusion protein GFP-REACh2 is nearly 25-fold lower than normal GFP expression under identical circumstances (same backbone, promoter, RBS, terminator and cultivation circumstances). This demonstrates a quenching percentage of GFP of ~96 %! To prove that the measured constructs were the same as assumed the plasmids were tested with specially designed Check PCRs with one primer binding upstream on the plasmid backbone and one primer binding specifically inside the insert. The following results were obtained for K1319014. The PCR clearly shows that the used plasmid had the correct insert. After a positive identification of K1319014 the double plasmid system was also checked for the correct TEV protease plasmid K1319008. This PCR also positively identified K1319008. Additionally both parts were sequenced. The sequencing data for K1319008 and K1319014 can be found in the parts registry. Galectin-3 is a 26 kDa protein that binds certain LPS patterns. It especially bind the O-section of the LPS. Galectins are proteins of the lectin family, which posess carbonhydrate recognition domains binding specifically to β-galactoside sugar residues. In humans, 10 different galectines have been identified, among which is galectin-3. Galectin-3 has a size of about 31 kDA and is encoded by a single gene, LGALS3. It has many physiological functions, such as cell adhesion, cell growth and differentiation, and contributes to the development of cancer, inflammation, fibrosis and others. Human galectin-3 is a protein of the lectin-family that was shown to bind the LPS of multiple human pathogens. Some of them, including Pseudomonas aeruginosa protect themselves against the human immune system by mimicking the lipopolysaccharides (LPS) present on human erythrocytes. K1319003 was used to create K1319020, a Galectin-mRFP fusion protein with a C-terminal His tag in the Heidelberger expression vector pSBX1A3. Expression in the pET17 vector was much more leaky than the expression in the pSBX vectors. The fusion protein was fully translated to the correct molecular mass of 74 kDa. This part is a TEV protease in RFC25 that was optimized for expression in E. coli. The part contains the S219V anti-self cleavage mutation. 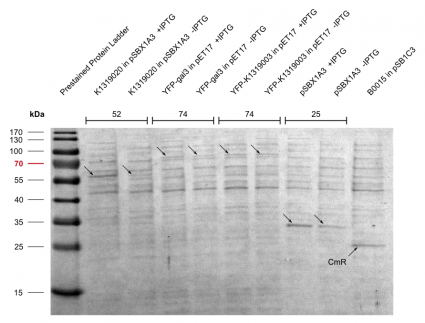 The TEV Protease (also known as Tobaco Edge Virus nuclear inclusion a endopeptidase) is a highly sequence specific cysteine protease from the Tobacco Edge Virus (TEV). The protease is highly sequence specific. The consensus sequence for the cut is ENLYFQ\S with \ denoting the cleaved peptide bond. This sequence can be found in the part K1319016. ENLYFQ\S is the optimal cleavage site with the highest activity but the protease is also active to a greater or lesser extent on a range of substrates. The highest cleavage is of sequences closest to the consensus EXLYΦQ\φ where X is any residue, Φ is any large or medium hydrophobic amino acid and φ is any small hydrophobic amino acid. The TEV protease is commonly used as a biochemical tool to cleave affinity tags from purified proteins like His-Tags. The high specifity makes the protease relatively non-toxic in vitro and in vivo. The molecular weight of the TEV protease is 27 kDa. The TEV Protease was used and characterizes in the K1319008 construct. To characterize the TEV protease we used the fusion protein K1319014. This fusion protein contains GFP (E0040) bound to a dark quencher (REACh2/K1319002) over a linker which includes the TEV protease cleavage site. If the TEV protease successfully cuts the linker, GFP and its quencher would separate and the FRET (Förster Resonance Energy Transfer) system would be shut down. This would result in an increased GFP fluorescence. 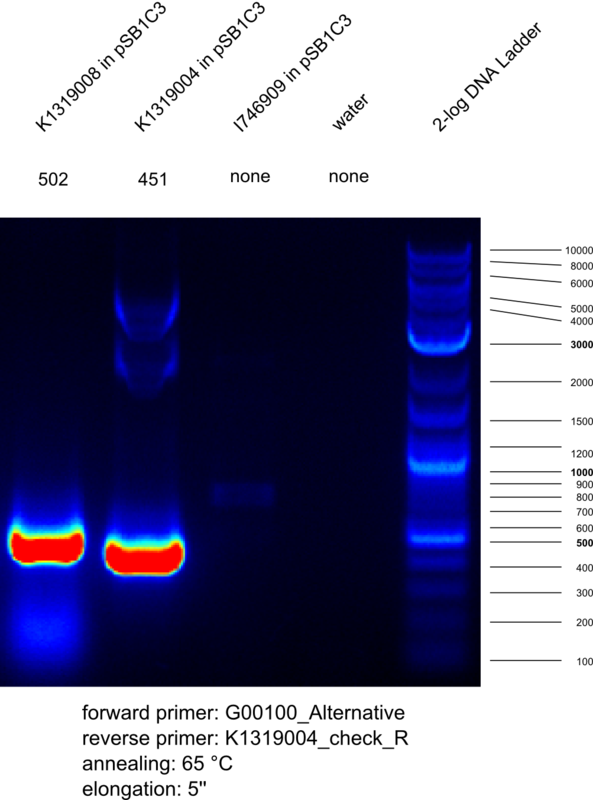 To demonstrate this behaviour a double plasmid system was designed using the biobrick K1319013 in a pSB3K3 backbone and K1319008 in a pSB1C3 backbone. Also I20260 was used as a positive control because it produces the same GFP as used in the fusion protein and is regulated by the same promoter, RBS and Terminator on the same plasmid backbone. B0015 was used as negative control. Induction of the double plasmid constructs occured after 2 h with 50 µl of 100mM IPTG in a 50 ml shake flask culture. The increase in fluorescence after induction with IPTG is clear sign of funtional expression of the TEV protease. The difference between not induced and induced plasmid is proof that the increase in fluorescence is only attributed to the successful cleavage of the linker. 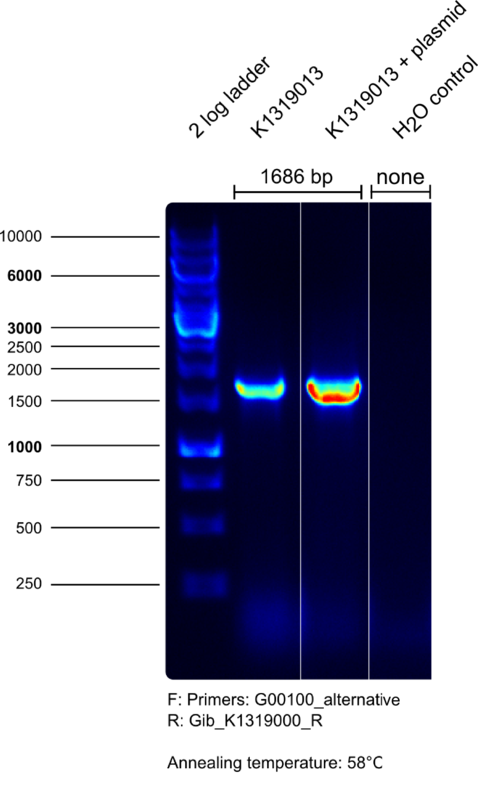 Therefore this is proof of a functional expression of the TEV protease after induction with IPTG. Furthermore we validated the used plasmid with a Check PCR with one primer binding upstream on the plasmid backbone and one specifically in the insert. This validates that the construct is indeed the TEV protease and thereby the functionality of the TEV protease is established. The construct K1319008 was also sequenced. The sequencing data can be seen in the parts registry here. This protein generator produces TEV protease when induced with IPTG in a DE3 strain. More information about the characterization of this part is available on the parts registry page for K1319004. This part was alos used in the validation and characterization of the parts K1319001 and K1319001. This biobrick is used in our REACh construct. This is a fusion protein created from E1010, K1319003 and K1319007. This part expresses K1319000 behind a J23101 constitutive promoter. This part expresses K1319001 behind a J23101 constitutive promoter. This part expresses K1319002 behind a J23101 constitutive promoter. This part expresses a E0040.K1319001 fusion protein (GFP-REACh1) behind a J23101 promoter. More information about the characterization of this part can be found on the part page of K1319001. This part expresses a E0040.K1319002 fusion protein (GFP-REACh1) behind a J23101 promoter. K1319002 is a dark quencher that eliminates the fluorescence of the GFP-domain by Förster Resonance Energy Transfer (FRET), but does not exhibit strong fluorescence itself. The two domains can be separated from each other via a TEV protease cleavage site in the linker. More information about the characterization of this part can be found on the part page of K1319002. This part expresses a E0040.K1319000 fusion protein (GFP-EYFP) behind a J23101 promoter. This sequence codes for a TEV protease cleavage site. A TEV protease is available codon optimised for E. coli with the part K1319004. This device produces iLOV (K660004) in response to a quorum sensing input. For more information about the characterization of this part check out K1319003. This part can be used for IPTG-induced expression of K660004 (iLOV).